Wampee Fruit Trees are as "Tough as old boots" once established and we show you how well they can crop in this video. The grafted varieties like Guys Sam and Yeem Pay taste great and fruit often in the first season. When growing in colder climates just protect them while they are young because they can handle frosts once established. 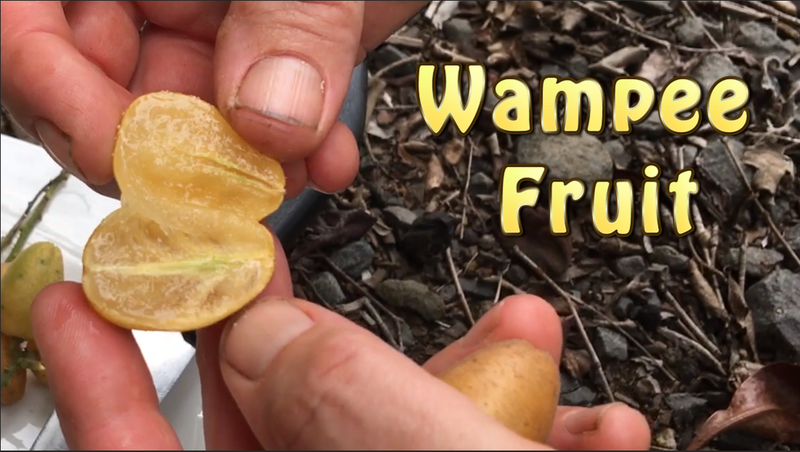 These great fruit are wampees and that's what they look like inside. There a bit like a grape inside. This beautiful clear translucent flesh just delicious and as you can see they come off the tree in these great panicles off the ends of the branches and the top of the tree. and there will be hundreds and hundreds of fruit when it's in full fruit. So we have been having a good feed off this tree. for a couple of weeks now so it's certainly past. it's best but it's still loaded. This particular variety is the Guy Sam which has these beautiful oval bronze coloured fruit and they're a little bit tangy in flavour so there is a sweeter one called the Yeep Pay. Now wampees are related to Citrus but you wouldn't guess that by the look of the tree or from the fruit but this particular variety the Guy Sam does have a little bit of tang. Now if you want to grow a wampee you need full Sun and good drainage. They're quite hardy they will take a light frost. to about -2 to -3 and if you can protect when they're small plants they certainly grow much better and you will get it off to a good start but once they're established like this they're as tough as old boots so they're really fabulous backyard trees and a great tasting fruit and we all love them here.